There are over 400 known orthodox Irish Ogham inscriptions. These range in age from 5th century or earlier to no later than the 7th century, and are most common in the south-west of Ireland. Inscriptions typically follow set formulas, for example “[stone of] x son of y”. The stones act as memorials to the dead and/or boundary markers. 3. Ogham was probably created in Ireland by people familiar with Latin grammar, to represent the sounds of primitive Irish. It was not a fixed system, but changed over time and to allow its use codifying other languages. The use of Ogham shows there was some form of literacy practised by a small group in Ireland before the arrival of Christianity. However Ogham is cumbersome for anything more than short inscriptions. Irish culture as a whole remained an oral one 4. “The learned class of an oral society is its embodied history, encyclopedia, lawbook and guide to acceptable conduct, as well as its source of entertainment”5. There was no Irish equivalent to the Greek Iliad. Instead there was a tapestry of myths, genealogies, laws, explanations and lore, differing according to area and local interests. The learned class consisted of the filid (often translated “poet” but their role was wider than that suggests) and brithemain (judges). This was the complex world to which Patrick came. He was not the only missionary to the Irish: in 431 “(according to Prosper of Aquitaine, Chronicle, S.A.) Pope Celestine I dispatched the newly-ordained Palladius as ‘first bishop to the Irish believing in Christ’ 6 showing at that date there were existing Christians in Ireland. In the account of Irish literacy, however, Patrick plays another role. His epistola to Coroticus and his Confessio, probably written in the fifth century, are the oldest texts, in any language, written in Ireland that have survived 7. Other than a letter written by a disciple of Patrick called Mochta which is now lost, there are no further texts until the mid-sixth century. These texts show a distinct monastic influence: monastic rules, handbooks of penance and canon law. Writers included Irish monastic founders and writers such as Comgall at Bangor and Colum Cille on Iona. What many accept as the earliest surviving continuous work in Irish, Amra Choluim Chille an elegy written for Colum Cille, was probably written soon after his death in 597AD8.. The monastic rule at Bangor was to shape the rule developed by Columbanus on the continent for Luxeuil. This acetic rule is in stark contrast to Columbanus’ letters which display an masterly style in Latin. The letters also provide evidence for the curriculum of the Irish schools, which centred on Latin grammar, biblical study, and the ecclesiastical calendar (computus). Latin grammar was of particular importance, since unlike foundations on the continent the Irish had to learn Latin from scratch. Irish teachers could not use the existing grammars of late antiquity and were forced to develop their own plan of elementary Latin instruction9. Columbanus clearly had access to many works dealing with computus. However he was writing on the continent. 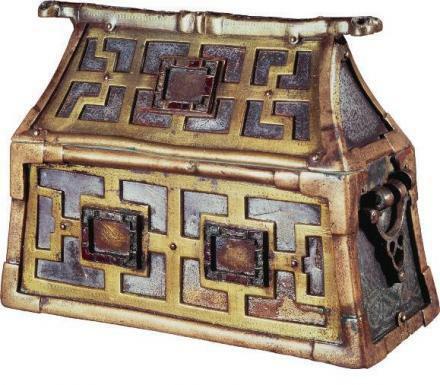 The question arises of how many works from antiquity were in Ireland in the seventh century. Examining those currently surviving will give an serious underestimate. Irish history was not conducive to preservation of manuscripts, with those surviving doing so by chance, eg. if held in a shrine or passed down through a family. For example, only an incomplete copy of Patrick’s Confessio is available in Ireland, in the Book of Armagh, preserved in the MacMoyre family. In contrast France yields three complete copies and Britain three more10. An alternative approach is to look at books cited by Irish writers. A paschal letter written by Cummian in the early 7th century, for example, includes quotations from the Bible and patristic commentary by Augustine, Jerome, Cyprian, Origen, Ambrosiaster, Gregory the Great, and some pseudopatristic works. The work also incorporates church history, canon law and synodal decrees. Looking at the end of the century, De locis sanctis written by Adomnán includes citations from Augustine, Cassiodorus, Gregory, Hegesippus, Jerome, Juvencus, Paulinus, Isidore, Pseudo-Eucherius, Sulpicius Severus and possibly Pliny 11 Some works available to the Irish would have been rare or non-existent elsewhere, for example Pelagius’ commentary on the letters of St. Paul, but most were not. Besides works preserved on the continent, the Byzantine Empire (effectively the surviving half of the Roman Empire in the east) preserved the patrician authors and the writers of ancient Greece and Rome. While an impressive array of texts, the corpus is clearly weighted towards religious and patristic authors. There is little evidence of works of philosophy or natural philosophy, counter to the myth that a large quantity of knowledge from the classical world was preserved in Ireland. However the Irish were creative with the little they had. The unknown author of De mirabilibus sacrae scripturae (‘On the miraculous things in sacred scripture’, written circa 655) avoids the allegorising in other commentaries to take a naturalistic approach to miracles (for more see this post). The author is not afraid to include his own knowledge: the work contains a list of the animals of Ireland. Another commentary written between the middle and end of the seventh century, Liber de ordine creaturarum (‘The Book of the Creatures’), attempts to outline the spiritual and material structure of the universe. It can be argued that the paucity of material allowed these Irish writers to develop their own views on the cosmos rather than being overwhelmed by the differing theories of the classical world. While hardly influential in the history of natural philosophy, these works are an interesting creation in their own right12. Just as these writers brought Irish knowledge into classical cosmology written in Latin, Irish histories and chronologies incorporated classical knowledge. The combining of vernacular and Latin learning is evident in chronologies which intertwine myths of Irish origins (presumably from oral sources) with Biblical stories. The linking of Irish to the Tower of Babel account (and elevating Irish to ideal language status so doing) is a case in point. Sagas and origin legends too are frequently synchronised with Biblical events. The process can be seen as “attempting to graft an Irish branch onto the tree of world history” making a place for the Irish in the known world13. Recording of contemporary events in the annals started c. 650. The interaction between classical learning and Irish culture can be seen too in the writing down of Irish law, which started in the seventh century. The arrival of the first book of Isidore’s Etymologies in the mid to late seventh century influenced Irish works, not only glosses explaining Latin or Irish texts, but in writing law, explaining obscure terms with reference to their supposed origins. (Often, this origin story is speculative and has little relation to the word’s use in the text.) This interest in the origin and explanation of words fed into a literature on the origins and fitness of names, whether those of heroes or places 14. By the end of the seventh century all but one of Isidore’s works had arrived in Ireland, changing the intellectual landscape. Just as Isidore’s encyclopaedic descriptions in the Etymologies broadened Irish knowledge of the Roman Empire and classical Latin literature, his treatise De rerum natura (on the nature of things) provided a compendium of new scientific and cosmological information. So fond did the Irish become of Isidore that they “referred to him affectionately as Issidir in chulmin (‘Isidore of the summit’, i.e. of the summit of learning)”. Along with Isidore’s words, other texts from Spain arrived, transforming computus and allowing extensive compilations of works on the calculation of Easter15. Recording the history of the Christian church in Ireland also starts at this time. 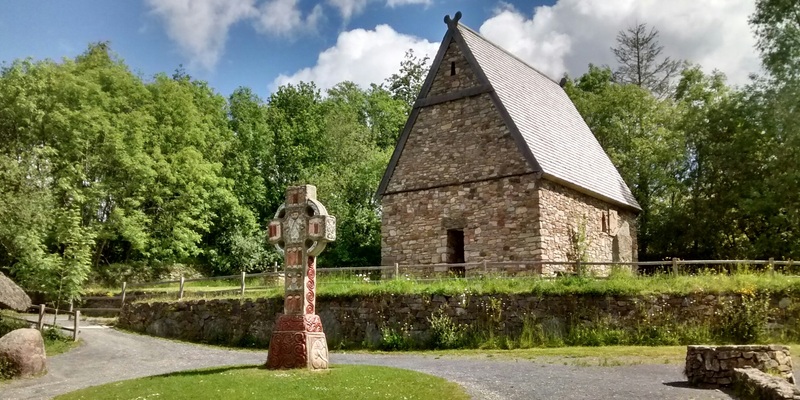 There was a rising interest in saint’s lives through the Christian world, but the motives in Ireland seem to be initially as much political as pious. The earliest life of a saint is probably Cogitosus’s Life of Brigit, founder of the monastery of Kildare. Its aim is apparently to “boost Brigit’s reputation as a wonder-worker and therefore a suitable candidate for veneration” in the contest between Kildare and Armagh for primacy. This seems too, to be the intention behind the writing on Patrick by Muirchú and Tírechán. The Paschal letter of Cummian already referred to “the holy Patrick” (sanctus Patricias) as papa noster (“our father”), and in the hands of Muirchú, Patrick is a heroic figure, converting the country through his defeat of the druids in Tara and the King of Tara, Loíguire. In contrast, Adomnán’s Vita Columbae, written closer to the events it relates, gives a much more authentic picture of its subject.16. At this time there were many in England, both nobles and commons, who, in the days of Bishops Finan and Colman, had left their own country and retired to Ireland either for the sake of religious studies or to live a more ascetic life. In course of time some of these devoted themselves faithfully to the monastic life, while others preferred to travel round to the cells of various teachers and apply themselves to study. The Irish welcomed them all gladly, gave them their daily food, and also provided them with books to read and with instruction, without asking for any payment. 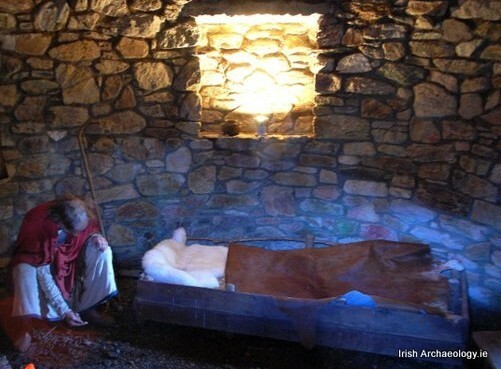 Early medieval Ireland attracted scholars. Ironically today it seems to attract myths that assume Irish isolation. One such is that Ireland was a backward and ignorant place, or more positively, one scarcely touched by Christianity or classical learning. Another is that Ireland was a lone shining light, preserver of all the knowledge of the past, without whom it would all have been lost. The truth, as far as we can make it out, is somewhere in the middle and a great deal more interesting. Peter Lynch (2016) “Ireland’s important role in calculating when Easter falls” in Irish Times (17 Mar 2016). The Foundations of Irish Culture is a website looking at Irish manuscripts between AD 600 and AD 850. It includes a number of useful essays. Richard Sharpe (2010) “Books from Ireland, fifth to ninth centuries”, Peritia 21, 1—55 (online at Foundations of Irish Culture). CODECS: Online Database and Eresources for Celtic Studies – includes links to existing manuscripts for a given text eg “Amra Choluim Chille” on (CODECS). UCC Celt a fantastic resource for Irish literature of all time-periods. Contains texts in Irish, English and Latin eg. “Amra Choluim Chille” in Lebor na hUidre (UCC: Celt), electronic edition compiled by Donnchadh Ó Corráin, Hildegard L. C. Tristram. Dáibhí Ó Cróinín A new history of Ireland, vol. 1: Prehistoric and early Ireland, Oxford: Oxford University Press – an extensive introduction to the period. Marina Smyth (1996) Understanding the universe in seventh-century , Boydell Press. Elva Johnston (2013) Literacy and Identity in Early Medieval Ireland, Boydell Press. Timeline of the Middle Ages – from History of Philosophy Without Any Gaps. The podcast series covers philosophy from antiquity, attempting to leave as few gaps as possible. Terry O’Hagan (2015) “Will the real St Patrick please stand up” on JSTOR Daily. St Patrick’s Confessio – Patrick’s texts, together with commentary and other associated works. Vox Hiberionacum – a blog (often irreverent) on archeology, early Ireland and the historical Patrick. Vox Hiberionacum (2014) “The Price of Patrick: Fifteen Men (On a Deadmans Chest)” on Vox Hiberionacum part 1, part 2, part 3. Trias Thaumaturga (2012) “Palladius and Patrick” – a blog post on an academic paper passionately defending the position of Palladius.